Summary : This is a pleasant but only moderately strong earl grey tea. If you like a slightly weaker tea, then you should like this one. Otherwise, if searching for a more typical and powerful flavor in your earl grey tea...find another one. Review : I'm a hopeless earl grey tea lover. I love the aroma. I love the flavor. And as such, I'll try any earl grey tea that I come across. Due to this addiction of mine...I was quite enthuastic about sampling the earl grey tea from Mighty Leaf. I personally have found Mighty Leaf teas to be absolutely superb...mainly because their bagged teas are actually put in tea pouches and contain true loose-leaf tea leaves. As such, I've found Mighty Leaf teas to be incredibly flavorful. Here is how Mighty Leaf describes this tea : "Organic Earl Grey is made of rich organically grown black tea leaves and golden buds with a twist of citrusy organic bergamot. 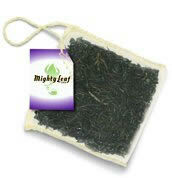 Mighty Leaf perfects the classic tea with an elegant, balanced and full flavored cup. Earl Grey himself would be proud." This tea contains the following ingredients : "Organic black tea, essence of bergamot, essence of jasmine." The aroma of this tea was moderately strong. It was a pleasant fragrance, and I had no complaints. It is just that it was not as strong as I was expecting or preferred. And the flavor of the tea more or less matched the fragrance. The flavor was quite pleasing...it just wasn't very strong. Now admittedly, this comes from the lack of ingredients found in the tea...as it doesn't have the laundry list of ingredients more commonly found in other earl grey teas. Because of this, the flavor of bergamot is quite distinct and pronounced...more so than in other earl grey teas. But, the overall flavor of the tea itself is of only moderate strength. Whether this is good or bad really depends on what you are looking for. If you want a more moderate strength earl grey tea...without a huge list of ingredients...then this tea will meet your requirements perfectly. But if you are looking for a earl grey tea with a "bit more sizzle," as if found in most other earl grey teas, you may be disappointed by the "lack of spice" found in this tea from Mighty Leaf. Recommendation : Yes. This is a very good and enjoyable earl grey tea. How much you enjoy the tea will greatly depend on how much flavor you want. Numi Aged Earl Grey Organic Black Tea : An excellent organic earl grey tea that doesn't use any pepper yet still has some nice spice to it.